The average cost of assisted living in Grand Junction is $3,603 per month. This is higher than the national median of $3,345. To help you with your search, browse the 27 reviews below for assisted living facilities in Grand Junction. On average, consumers rate assisted living in Grand Junction 4.2 out of 5 stars. Better rated regions include Delta with an average rating of 4.4 out of 5 stars. Caring.com has helped 5 families in Grand Junction find high-quality senior care. To speak with one of our Family Advisors about assisted living options and costs in Grand Junction, call (855) 863-8283. The most populated city in Mesa county, Grand Junction serves over 62,000 people, 16.6 percent of whom are age 65 and over. Seniors may enjoy viewing the grand rock scenery of the Colorado National Monument on a 23 mile driving tour known as Rim Rock Drive or strolling through the Downtown Grand Junction's art galleries, boutiques, drama and music festivals. Popular spots there are the Avalon Theatre and the Museum of the West. Seniors who desire to age in place here can choose from eight assisted living facilities in Grand Junction with a dozen more in the nearby cities of Fruita, Delta, Montrose and Glenwood Springs. The American Lung Association gave an Ozone ranking of C and a Particle Pollution 24-hour score of B to Mesa County. While this isn't ideal, Colorado residents with a respiratory illness may have an easier time breathing here than in areas such as Jefferson or Boulder Counties. The cost of living in Grand Junction is 0.30 percent lower than the national average, making it nearly 16 percent cheaper than the rest of the state. This could be a potential benefit for seniors looking to pinch a few pennies. Violent crime in this city is 30.0 out of 100 compared to the national average of 31.1 (1 is the safest). Property crime, on the other hand, is high at 52.0 compared to the U. S. average of 38.1. The extreme highs and lows of Grand Junction may be difficult for some seniors. Temperatures in July can reach a high of 94 degrees, and January drops to a low of minus-17. The Grand Junction area is home to world-class medical facilities, including St. Mary's Medical Center and Community Hospital, in the event of medical emergencies or illness. Mesa County's Grand Valley Transit offers discounted annual and monthly passes for seniors. Seniors with limited mobility, scooters or wheelchairs can take advantage of the buses built with accessibility lifts. Assisted Living costs in Grand Junction start around $3,482 per month on average, while the nationwide average cost of assisted living is $4,000 per month, according to the latest figures from Genworth’s Cost of Care Survey. It’s important to note that assisted living rates in Grand Junction and the surrounding suburbs can vary widely based on factors such as location, the level of care needed, apartment size and the types of amenities offered at each community. 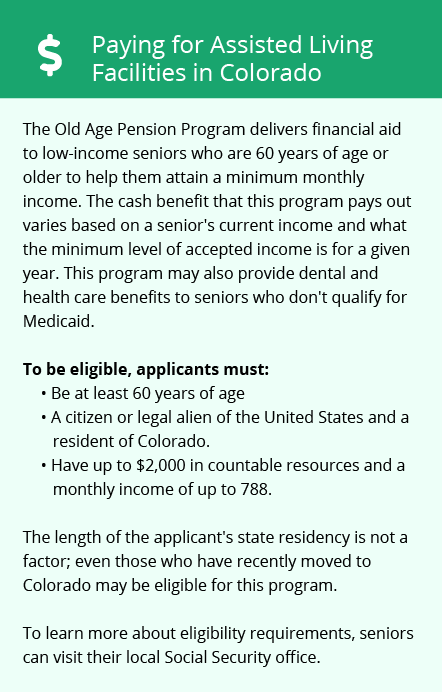 Eligible seniors can apply to three non-state funded programs to alleviate assisted living expenses. 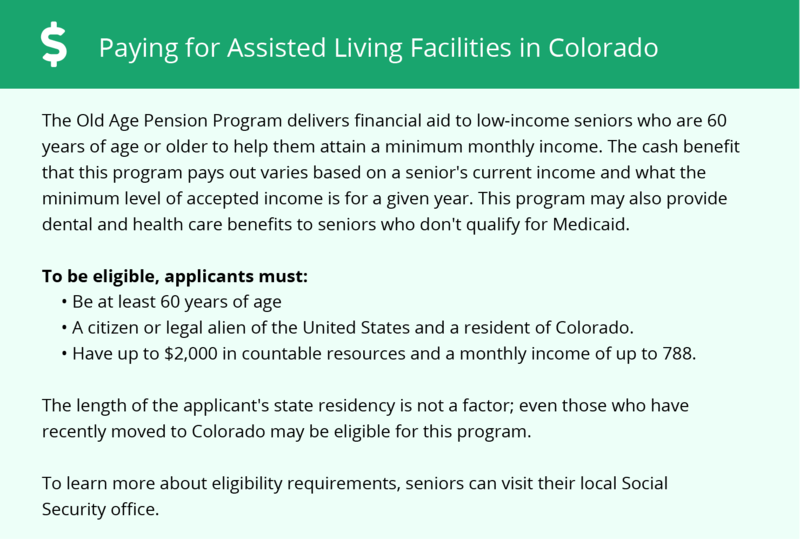 Health First Colorado, the state's Medicaid plan, provides waivers for qualified individuals to help covers costs associated with assisted living facilities. Grand Junction and the surrounding area are home to numerous government agencies and non-profit organizations offering help for seniors searching for or currently residing in an assisted living community. These organizations can also provide assistance in a number of other eldercare services such as geriatric care management, elder law advice, estate planning, finding home care and health and wellness programs. To see a list of free assisted living resources in Grand Junction, please visit our Assisted Living in Colorado page. Grand Junction-area assisted living communities must adhere to the comprehensive set of state laws and regulations that all assisted living communities in Colorado are required to follow. Visit our Assisted Living in Colorado page for more information about these laws.